Hi everyone and welcome to another episode of The Art of Business English. This week we are going to continue with our mini-series on presentation skills. Today I want to cover how to develop the body of your presentation and cover some essential language to help you confidently move through the delivery of your presentation. If you’re the type of person who struggles with confidently delivering an effective presentation in English, then this episode will arm you with the tools you need to present like a champion. If you haven’t taken a look at episode 39 on how to open a presentation, then I encourage you to do that. There is some very important information that will help you to better develop this stage of your presentation. Yes, I want to receive help and weekly podcasts via email. So, you should recall that in the previous episode I discussed the importance of having a very clear core message. This is our communicative objective, we must have a central message as this is the central piece that all our points in the body of our presentation must support. You will also recall that I mentioned the three steps of preview, give and review. Preview is the introductory stage where we explain what we are going to discuss, give is the body of the presentation and this is where we discuss all the points that support our core communicative objective and finally review where we summarise and conclude our presentation. Today we are going to be focusing on the give stage of the presentation, however it is critically important that you understand that this three-step process actually continues throughout the body of the presentation. What do I mean by that? Well, in the body of your presentation you will have your main ideas, which are all linked to your core message. When you introduce each of these ideas you will follow the same principle of preview (where you introduce the main idea), give (where you explain the main idea with support evidence or arguments) and review (where you summarise and bring that idea to a close before moving onto the next one). So, what I am saying is that the preview, give and review model is used at the macro and micro level across your presentation. Now that we understand the 3-step process, we need to now discuss the structure of the body. The structure can be best represented in a graphical form, if you head over to the AOBE website for this episode you can login and take a look. However, I will now explain it simply. At the centre of our presentation is the core message or communicative objective. This must be very clear and convincing. Around this main idea, we have 3 or 4 main points, which, must be clearly aligned with our main idea. The purpose of our main points is to help transmit to the audience the core message of our presentation. Following on from that, the 3 or 4 main ideas but also have supporting information, evidence and examples. Supporting information is how we demonstrate the validity of each of our main idea, which in turn helps to validate our core message. So, you can see that every step of the process is linked, with the objective of validating our core idea. I hope that is clear, if you do have questions, then please shoot me an email, I will be more than happy to clarify it. Right, you may be wondering how to build strong supporting information. If you are, then here are some ideas for you. One thing make sure that these fit the form of the content of your presentation. Remember, people always move away from situations of pain or discomfort, towards comfort and pleasure. If you are trying to convince your audience you must present your core idea as the solution to whatever pain or discomfort it will solve. So, to summarise, we must have our core message clear from the beginning as it is the foundation of our presentation. We need to follow the 3-step process of preview, give and review across our presentation. We also need to structure our presentation around our core idea with 3 or 4 main ideas. These ideas are aligned with our core message and finally, these ideas are validated with supporting information or evidence. Now we are going to look at some essential language and expressions to help you structure your presentation body ideas. I’m going to go through some essential language now. I’ll start by listing the function and then review the related expression. I might add that... (To emphasis, be sure to change the tone of your voice). Clarifying: Is everyone OK with that? Was my last point clear? Any questions up to this point? OK, so there you have the building blocks for creating a presentation body. Remember what I said in last week’s episode. It is essential that we plan and write out our presentation before we load up PowerPoint. We need to be able to brainstorm and put ideas down in a mind-map form as opposed to the linear work flow of PowerPoint. We will use PowerPoint at the very end, but not as a central part of our presentation, only as a supporting tool with relevant graphical information as opposed to text. In the next part of the episode, I am going to show you what a typical presentation body will look like. We are going to continue with John’s presentation from last week’s episode. I will introduce one main idea from his presentation and show you the language and preview, give, review process we can follow. If you recall from last week, John was giving a presentation to management about sales from the Christmas period, his main points in the body were, the results from the Christmas sales campaign, current market trends and finally forecasts for the coming year. So, let’s take a look at how this might look in the body. Well, that is all I want to say about that. Now I’ll move on to my second point today, market trends. That covers my second point. Is everyone OK with that? If that is clear, I’ll continue with my last point, forecasts. That brings me to the end of my last point, I would now like to conclude by quickly summarising the main ideas. OK, there you have a very basic outline of the body of a presentation. Obviously, there is a lot of information that you need to fill in to form the actual contents, however today I want to show you how easy it is to use signalling and sequencing language to introduce an idea, then bring it to a close and then transition on to the next idea. Let’s quickly review it together. You can see that each idea has a mini-introduction. For example, Right, let’s begin with the sales data and analysis. Then a closing remark, Well, that is all I want to say about that, and finally a transition to the next idea, Now I’ll move on to my second point today, market trends. When we use these expressions effectively we can easily structure the body of our presentation and obtain a very clear flow. Well, that brings us to the end of this episode. 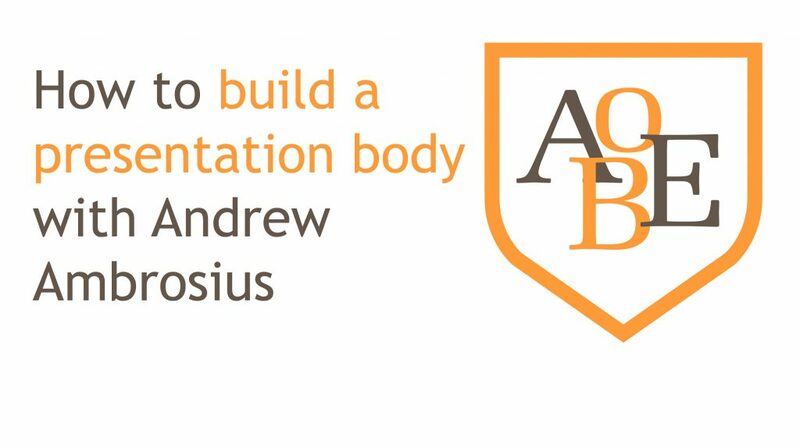 You now have the tools to develop the body of your presentation. If you’re working on a presentation at the moment, send it through and I’ll give it a quick review and my comments. As always, I hope you have found this episode useful and of value. If you did enjoy it please feel free to share it with your friends, family and colleagues and be sure to give us a 5-star review over at iTunes. Currently I am working on rolling out the AOBE Masters program over at the AOBE website. If you’re interested in trying out the AOBE Masters membership then please feel free to send me an email and I will make sure you get 3 months of free access. We really want to get first hand feedback from our loyal listeners and ensure that we can help as many people as possible. Well, that’s all from me, until next week, take care and have a great week. Listen to the following 10 words. Then record yourself below. Try and match the correct pronunciation and intonation.